When it comes to unusual town names this on may have you scratching your head. Deep in Monroe County, about 80 miles southwest of Montgomery, sits the town of Scartch Ankle. Monroe County Alabama, located in the southwest part of the state, has a population of 23, 068. The county seat is Monroeville Alabama. For thousands of years the area was inhabited by indigenous peoples. In historic times, it was primarily the territory of the Creek peoples, who became known to European-American settlers as one of the Five Civilized Tribes of the Southeast. Monroeville is the county seat of Monroe County. The town was initially known as Walker’s Mill and Store, named for Major Walker, the area’s first white settler. In 1832, the county seat was relocated to Monroeville from Claiborne on the Alabama River. The park is located at 580 H-Kyle Road in Atmore AL 36502 | 251-862-2511 and is managed by Ironmen Outdoor Ministries, a non profit organization. 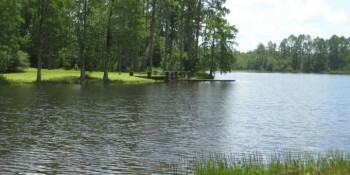 The 2,100 acre park includes a 25 acre lake with both boating and fishing facilities. You can also enjoy hiking, swimming, biking, zip-lining and camping.